With the blink of an eye. It is over. Blink and you may actually miss Usain St. Leo Bolt run. Thank God for YouTube. Inspiring runners from across the globe will only now watch to marvel moreover hope to duplicate the Olympic career of arguably the world’s fastest human alive. Bolt said farewell to the Rio de Janeiro Olympics, and perhaps the Olympics altogether. He turned a close 4×100 relay race against Japan and the United States into a runaway, helping Jamaica cross the line in 37.27 seconds. With the victory, Bolt won his ninth career Olympic medal and completed what I like to call a three peat-triple, with three gold medals at three consecutive Olympics. There is no one threatening his greatness on the track either. The U.S. finished the race third but endured yet another 4×100 relay disaster. The Americans were disqualified because it was ruled that leadoff runner Mike Rodgers passed the baton to Justin Gatlin outside the exchange zone. Canada was elevated to the bronze-medal position in a national-record 37.64 seconds, trailing silver medalist Japan. USA Track & Field said early Saturday morning that it had appealed the decision. This marked the ninth time since 1995 the U.S. men have been disqualified or failed to get the baton around at the Olympics or world championships. Along with Bolt for his final trip down the track were Nickel Ashmeade, training partner Yohan Blake and the Jamaican veteran, former world-record holder Asafa Powell. “My team came through for me tonight,” Bolt said. “As long as we got the baton round, it was never in doubt.” When Bolt received the yellow baton from Ashmeade for his final run down the straightaway, he looked a step behind, Japan’s Asuka Cambridge and Trayvon Bromell of the United States. Blink and he had daylight. I remember the 1992 Barcelona Olympics because of the NBA’s Dream Team roster. Throughout my high school and college years I was not mature enough to grasp what the Olympics symbolized moreover social media did not add to the global experience I have today. But if you have watched the Olympics from 2008-16, there’s a good chance you will say Usain Bolt. Or Michael Phelps. There are names in the running however they are atop the list for their sports, and both important to the Olympics games. Thirty-five million viewers tuned in to Bolt’s 100-meter race, a huge boost in ratings. A race that lasted 10 seconds. His charm, his confidence and Olympic greatness will only propel Bolt to new heights post track and field. There have been echoes of him labeled as the greatest Jamaican over the late Bob Marley who infused his music with a sense of spirituality. A year of bad publicity entering the Olympics from doping, cheating and shady characters. When on the track, Bolt captured the joy infused in the stadium of roaring crowds to see his speed leading everyone to forget their worries. 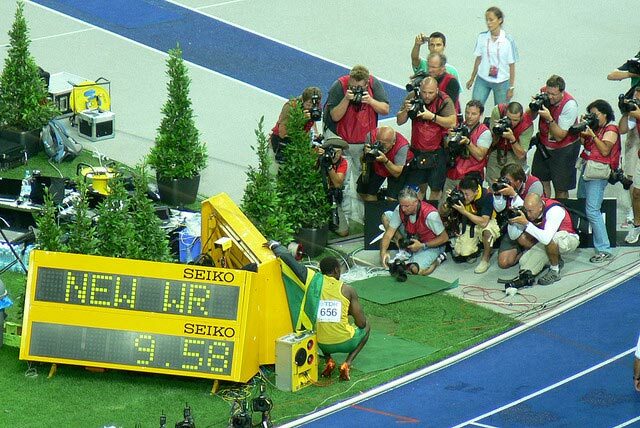 Bolt started running at 9 years old. Bolt has been clocked at running 28 miles per hour. When he crossed the line the final time pumping his fist in the air, he huddled with his teammates, and they prayed. Then a final walking appearance around the track for fans. After a long media appearance confirming this is his last Olympics, Bolt had one last thing on his bucket list. He celebrated by returning to a darkened Olympic Stadium, surrounded by volunteers and throwing a javelin. Bolt took a couple throws of the javelin, the last one going about 50 meters. He posed for some pictures afterward; with the javelin which he requested a formal measurement of still stuck in the Olympic Stadium turf. Bolt’s final throw would have earned him a sixth-place finish at this year’s Jamaican National Championships. Bolt’s lower back and hamstring needed constant supervision and his training was often customized to limit the possibility of injury. I would still not blink. Bolt racing as his body depreciates on another track moving forward will remind you he is gone but not forgotten.